This feature on Titan is at least 100,000 square kilometers (39,000 square miles), which is greater in extent than Lake Superior (82,000 square kilometers or 32,000 square miles), which is one of Earth’s largest lakes. The recentdiscovery of lakes on Saturn's moon Titan make it the only other object in thesolar system known to have liquid on its surface. However, dipping 179?C(290?F) below freezing, these lakes are definitely not filled with water. "Thewater is frozen so solid on Titanthat you can liken it to silicate rocks on Earth," says Vincent Chevrierof the University of Arkansas. The liquidon Titan is likely a hydrocarbon cocktail of mostly methane and ethane, judgingfrom observations by the Cassini-Huygens space probe. The exact proportions areuncertain because scientists have little data on how these substances behave atsuch low temperatures. "Therewas never before much interest in the liquid and solid properties of methaneand ethane, since they are normally gases on Earth's surface," Chevriersays. But that'sall changed. Titan's "liquid assets" drive geologic and chemicalprocesses that may mimic those on ourown planet. To better understand this, Chevrier and his colleagues havereceived NASA funding to recreate Titan's surface in a lab. 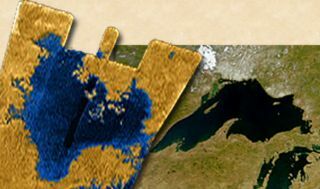 Thanks toradar maps taken by Cassini, we know that the polar regions of Titan are dottedwith numerous lakes. Some of these are as large as the Great Lakes in the U.S.
Scientistsare not sure where these large bodies of hydrocarbons come from. Onepossibility is that methanerain and possibly ethane snow drive a "hydrological cycle" thateventually drains into these lakes. Alternatively,Titan may have large reservoirs of liquid underground, and the lakes are theresult of impact craters carving deep enough to expose this sub-surfaceocean. It has beendifficult to rule out any of these hypotheses in part because the process ofevaporation from the hydrocarbon lakes in Titan?s environment is poorlyunderstood. If researchers knew how fast the lakes were disappearing, theywould have a better sense of what makes them appear. "Therates of exchange of hydrocarbons over seasonal and potentially longer climatecycles on Titan is an important goal of current research," says OdedAharonson of the California Institute of Technology, who is not involved withthis new project. For theirpart, Chevrier's team will be measuring the evaporation rates of methane andethane in a Titan simulation chamber. To mimic the moon's atmosphere, the2-meter-high steel cylinder will hold ultra-cold nitrogen gas at a pressureabout 50% higher than on Earth. Chevrier'sgroup will introduce small quantities of methane and/or ethane into thechamber. Below about 95 Kelvin (or ?178 degrees Celsius), the hydrocarbon gaswill condense into roughly 1 centimeter deep "mini-lakes" at thebottom of the cylinder. The researchers will then raise the temperatureslightly and record the rate of evaporation. It isassumed that ethane (whose molecules are heavier than methane's) will have amuch slower evaporation rate, but by how much is unknown. It's even less clearwhat happens when methane and ethane are mixed together, along with nitrogengas dissolving in from the atmosphere above. "It ishighly likely that the lakes are in fact complex mixtures of ethane, methaneand nitrogen," Chevrier says. "We will study the behavior of purecompounds first and then shift to mixtures." The teamalso plans to look at the possibility of other organiccompounds mixing in with the Titan broth and perhaps slowing theevaporation. Determiningthe evaporation rates on Titan will not only help sort out the geologicprocesses that formed the lakes, it will also provide some needed informationabout the atmospheric chemistry. Titan isthe only moon in our solar system with a substantial atmosphere. The moon?ssurface is totally obscured by an orange haze made up of complex organics(called tholins), which form when methane is destroyed by ultraviolet lightfrom the Sun. This samesort of organic chemistry may have gotten the biological ball rolling on Earthbillions of years ago. "Titanshows how you can have organic reactions without life," Chevrier says.Such organic chemical reactions may have provided the first necessary stepstowards the origin of life on Earth. On Titan,because the methane-fueled organic reactions in the atmosphere end updestroying the methane molecules, to keep the reactions operating a constantsource of gaseous methane is needed. The evaporation of methane from Titan?slakes may be one such source, and Chevrier's data should help say whether it isenough. "Titan'ssurface is rich with geological features similar to those found on Earth butbased on different materials," says Christophe Sotin from the JetPropulsion Lab in Pasadena. "So any lab experiment that can reproduceconditions on Titan and give some pieces of information of the processes thatcan happen on this moon are important."